I got some free promos for games I don't own, does anyone want these? 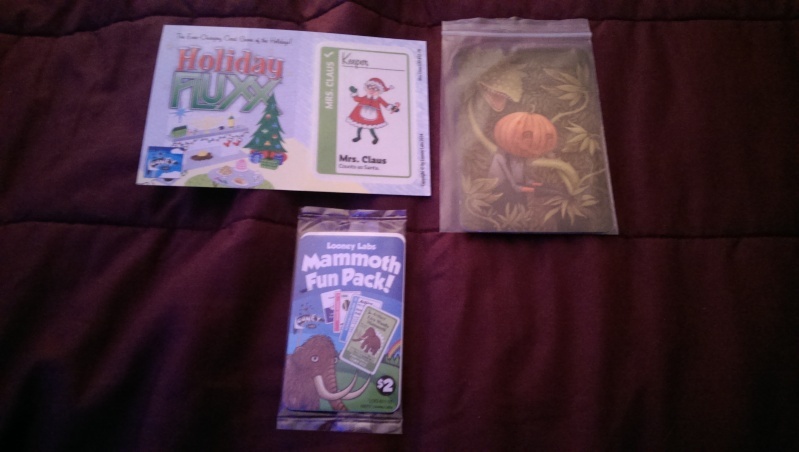 3) Holiday Fluxx "Mrs. Claus"
Live Woolly Mammoth (Chrononauts) - a new artifact for the game, something neat to collect. Knock, Knock (Monster Fluxx) - a new goal for Monster Fluxx, you need the Spooky Door and Angry Mob of Villagers to win! Fluxx or Looney Pyramids (Choose One) - It begs the question of which one would you choose: Fluxx or Looney Pyramids? Scramble Colors (Fluxx: The Board Game) - A new Action card: "Gather up all color cards currently in use, shuffle them together, and deal them back out." It really switches things. RikTheChief wrote: I got some free promos for games I don't own, does anyone want these?